Westphal, Germany, 1982. 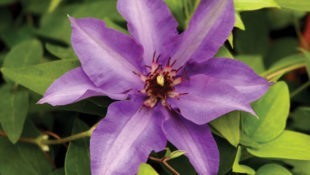 Clematis Konigskind(tm) (or Climador) is a wonderfully compact seedling of Clematis The President. It’s short stature and upward-facing 5 inch flowers make it excellent grown in a container on your patio or deck.